The aim of this study has been to analyze how Birgitta established her authority and exercised power in the social context of her time. The emphasis has been on concrete situations that occurred during the early stages of Birgitta’s career when she was still in Sweden and tried to influence other people’s conduct and make them change their lives. I have treated an individual’s ability to act and influence people as a central aspect of power. Power and authority are hard to distinguish. 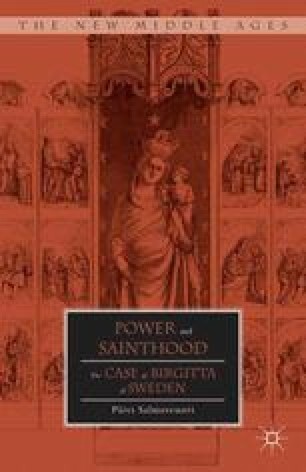 I suggested in the introduction that, in practice, authority means, “to be listened to.” Therefore, concerning Birgitta of Sweden, it could be said that if she did not have authority she could not have had power either. Consequently, having authority is a prerequisite for having power. The effects of Birgitta’s exercising of power—although hard to measure—can be seen in the actions of people: they changed their conduct according to her proclamations.